Payments accepted ~ Money Order ... PA residents must pay 6% sales tax unless you have a valid resale number. We mail to the United States only. 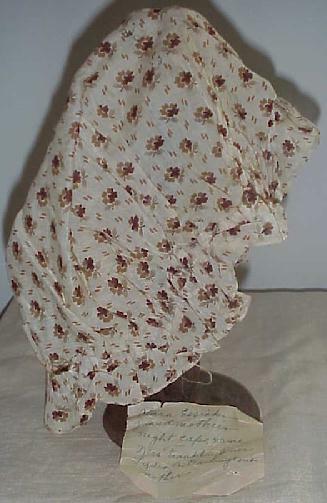 Purchaser is responsible for Priority Mail and Insurance Costs. All sales final ~ no returns accepted .. 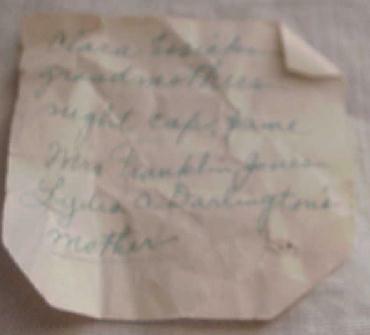 Early brown calico night cap ~ found with a note ~ Clara Essicks Granmothers night cape ~ name Mrs Franklin Jones ~ Lydia A. Darlington’s mother.